Full view of the baby's Dr Seuss crib quilt made by mommy! Black, floating wall shelves displaying my collection of plush Dr. Seuss toys. The Dr. Seuss patchwork quilt that I made draped on the end of the baby's crib and a peek of the polka dot nursery wall. I chose a fun and vibrant Dr. Seuss nursery design for my baby that will be enjoyed by all. The colors and design will easily work for a boy or girl and will be appropriate through the toddler and elementary school years. To give you all some background; I am a teacher so it was natural that I would lean towards a baby nursery theme that included children's literature. 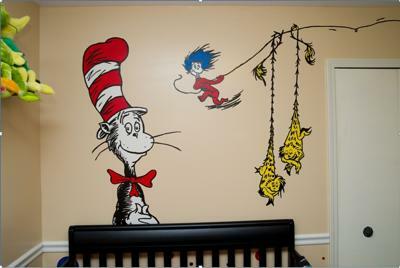 Go here to see many fabrics and items that can be used to decorate your child's Seuss themed room. Since Dr. Seuss is a unisex theme we were able to start preparing very early in my pregnancy. 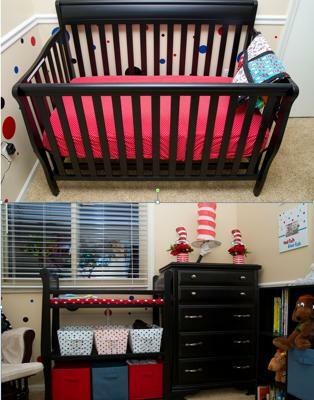 How did you choose and organize your baby's Dr Seuss nursery color scheme? I matched up the colors used in the nursery to the colors of the books' illustrations. I wanted to keep the color scheme very basic and not use too many different colors. Interestingly enough, the first colors a newborn baby sees are red, black, and blue. The storybook characters on the top section of the nursery wall are so beautifully done! Could you please share some tips and tell us how you painted them? I hand painted the Dr. Seuss murals on the upper part of the using latex paint. The polka dots on the walls are not painted they are stickers. The chair-rail was installed to separate the two concepts. Did you find a special collection of Seuss nursery furniture? The dresser in the nursery was actually my own dresser when I was a baby. I refinished it black and changed out the hardware. I love the colors and the colorful Dr. Seuss fabrics in the patchwork crib quilt, did you make it yourself? 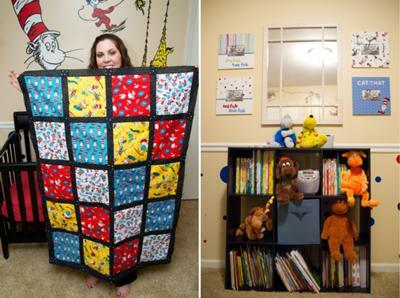 I made the baby Seuss bedding, the changing table cover and the patchwork quilts myself. Would you consider making a similar crib set for someone who wanted a quilt or baby bedding set just like yours? If anyone would like for me to create something similar to what I used or if someone would like for me to help them coordinate a custom set with colors that are completely their own, they can find me through Kate's Custom Baby Bedding on Facebook. It's very clear that, as an educator, that putting reading material within easy reach is very important to you. Can you tell us about the books that you chose for your baby's room? In addition to the baby Seuss themed bedding and quilt, I had to have a literature collection and bookshelf in the nursery since I read to my son every night. I love the cute stuffed toys displayed on the shelves. Were those yours when you were a child? I have been collecting the Dr. Seuss plush toys for a few years in preparation for decorating the nursery and we displayed them on black floating wall shelves. Thanks for sharing the pros and cons of this themed approach to decorating with this first-time mom-to-be! Where did you find the decal of the yellow one holding the stick with the red hand? We have been searching for it but can't find it anywhere! Join in and write your own page! It's easy to do. How? 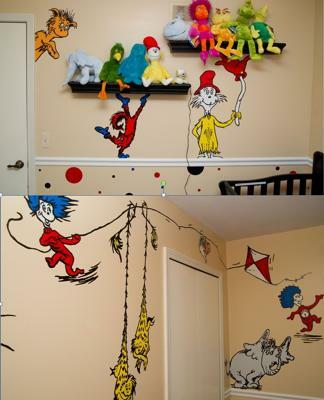 Simply click here to return to DR. SEUSS NURSERY THEMES.